Islamic music may refer to religious music, as performed in Islamic public services or private devotions, or more generally to musical traditions of the Muslim world. The classic heartland of Islam is the Middle East, North Africa, the Horn of Africa, Iran, Central Asia, and South Asia, and it also included the medieval Iberian peninsula (al-Andalus). Due to Islam being a multi-ethnic religion, the musical expression of its adherents is vastly diverse. Indigenous traditions of various part have influenced the musical styles popular among Muslims today. All of these regions were connected by trade long before the Islamic conquests of the 7th century, and it is likely that musical styles traveled the same routes as trade goods. However, lacking recordings, we can only speculate as to the pre-Islamic music of these areas. Islam must have had a great influence on music, as it united vast areas under the first caliphs, and facilitated trade between distant lands. Certainly, the Sufis, brotherhoods of Muslim mystics, spread their music far and wide. Muslim-majority Indonesia has been significantly less influenced by Middle Eastern traditions than South Asia. As a result, many local musical styles predate the coming of Islam, although exceptions include Malay Zapin and Joget, and the Indonesian Gambus, all of which show strong Middle Eastern influence. Nasheeds are moral, religious songs sung in various melodies by some Muslims of today without any musical instruments. However, some nasheed groups use percussion instruments, such as the daff. Singing moral songs of this type without instrumentation is considered permissible (halal) by many Muslims. Some famous nasheed singers are Native Deen, Outlandish, UNIC and Raihan. Other well-known artists are Ahmed Bukhatir, Yusuf Islam (formerly known as Cat Stevens), Ahmed Mac, Sami Yusuf, Junaid Jamshed, Zahid Ullah Afridi, Maher Zain, Harris J, Hamood ul khuder, Hamza Namira, Raef, Jae deen (Deen squad), Mesut Kurtis, Dawud Wharnsby, Zain Bhikha. Shi'a qawwali performances typically follow the naat with a manqabat in praise of Ali, and sometimes a marsiya, a lamentation over the death of much of Ali's family at the Battle of Karbala. The most well-known qawwali singer in modern times is Nusrat Fateh Ali Khan. Madih nabawi—Arabic hymns praising Muhammad. Yet some Muslims believe that any instrument is lawful as long as it is used for the permissible kinds of music. Hence there is a long tradition of instrumental accompaniment to devotional songs. A wide variety of instruments may be used, depending on local musical traditions. The question of permissibility of music in Islamic jurisprudence is historically disputed. Imam al-Ghazzali, one of the most famous Muslim scholars, writing almost a thousand years ago, reported several hadith and came to the conclusion that music is permitted, saying: “All these Ahadith are reported by al-Bukhari and singing and playing are not haram.” Despite this, some Salafist groups interpret the chapters of Luqman and Al-Isra in the Quran as evidence that music is haram, although this is disputed by others who disagree. Those who do not allow music believe that Muhammad censured the use of musical instruments when he said: "There will be among my Ummah people who will regard as permissible adultery, silk, alcohol and musical instruments". Islamic scholars of the past who agreed upon this include Abu Hanifa, Al-Shafi'i, Malik, Ahmad bin Hanbal, Al-Tabari, Al-Hasan Al-Basri, Al-Bukhari, Al-Tirmidhi, Al-Nawawi, Al-Bayhaqi, Al-Tahawi, and Al-Qurtubi. However, those who argue that music is halal (permitted) state that this hadith relates to usage—at the time the polytheists used music and musical instruments as part of their worship- and does not apply to all music. They also point out that in the Quran, it is stated that Hazrat Dawud was given the Psalms. (an-Nisa, 4/163; al-Isra, 17/55). In other Islamic resources, it is stated that the Psalms given to Hazrat Dawud were sent down in the month of Ramadan, that it contained sermons and words of wisdom and that Hazrat Dawud usually recited it accompanied by a melody and a musical instrument; therefore music is permitted. Supporters of this view also point out that in classical Islamic jurisprudence and Sharia, the Quran is the higher authority on correct Islamic practice; the hadith, while important, are secondary to the Quran. Those who saw the permissibility of music include some of the most famous Muslim scholars, jurists, philosophers, and Sufi poets of the Muslim world, including Abu Bakr ibn al-Arabi, Ibn al-Qaisarani, Ibn Sina, Abu Hamid al-Ghazali, Rumi, Ibn Rushd, and Ibn Hazm. Al-Ghazali also reports a narration from al-Khidr, where he expressed a favorable opinion of music, provided it be within the usage limitation of virtuous areas. Al-Ghazali has been referred to by some historians as the single most influential Muslim after the Islamic prophet Muhammad. 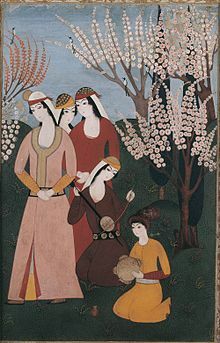 According to some authorities, Islam does allow singing without musical accompaniment within prescribed circumstances—namely that the performer be of the same gender as the audience, although this contradicts a well-known hadith in which two girls sang a song to the Prophet Muhammad and he instructed Abu Bakr to let them, stating, "Leave them Abu Bakr, for every nation has an 'Id (i.e. festival) and this day is our 'Id.". Others hold that music is permitted in Islam provided that the lyrics are not obscene or vulgar. Based upon the Shia ahadith, Grand Ayatollah Sadiq Hussaini Shirazi (an opponent of the current theocratic regime in Iran) ruled that all music and instrument playing is haram, no matter the purpose. However, this is not the official position of the Islamic Republic of Iran. Grand Ayatollah Ali Khamenei, the current supreme leader of Iran, has stated his admiration of western music, and music is permitted in Iran as long as it is either Iranian folk music, Iranian Classical music, or Iranian pop music. ^ Youssefzadeh, Ameneh (2000). "The Situation of Music in Iran since the Revolution: The Role of Official Organizations". British Journal of Ethnomusicology. 9 (2): 35–61. doi:10.1080/09681220008567300. JSTOR 3060645. ^ a b "Is music prohibited in Islam?". www.islamawareness.net. Retrieved October 27, 2016. ^ "Music & Singing - Submission.org - Your best source for Submission (Islam)". submission.org. ^ Watt, W. Montgomery (1953). The Faith and Practice of Al-Ghazali. London: George Allen and Unwin Ltd.
^ "Music and Singing: A Detailed Fatwa". SunniPath. Archived from the original on 2008-04-23. Retrieved 2008-04-01. ^ "Is there room for music in Islam?". BBC. 2007-08-07. Retrieved 2008-04-01. ^ a b Magrini, Tullia (2005). Music and Gender: Perspectives from the Mediterranean. University of Chicago Press. p. 270. ISBN 0-226-50165-5. ^ "Ayatollah Sayed Sadiq Hussaini al-Shirazi » FAQ Topics » Music". www.english.shirazi.ir.